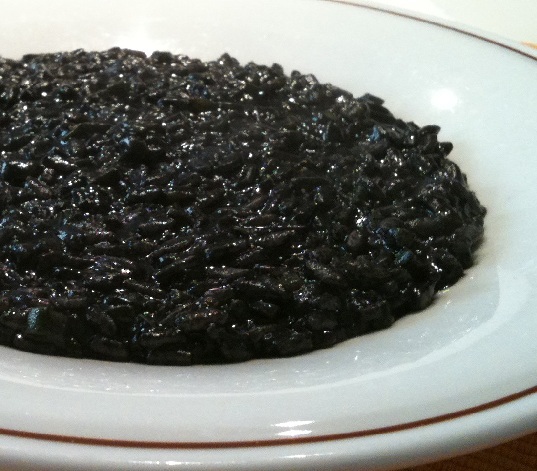 Risotto al Nero di Seppia: Risotto al Nero di Seppia or Black risotto made with cuttlefish or squid ink. Those who have never tasted risotto with cuttlefish ink “nero di seppia”, will probably turn up their noses just thinking about eating it. The ink gives a pearl look to the risotto rice and has a taste of sea. In a way it is sea on your plate. Heat the olive oil in a saucepan or cocotte. Add in the chopped onions and bell pepper. Cook on medium heat, stirring, until softened and translucent, takes about 8 to 10 minutes. Add the rice to the saucepan. Note: Do not burn the rice. Add the white wine to the rice. Cook, stirring often till the wine is completely absorbed. Add in the squid ink along with a ladleful of fish sauce. After the fish stock is completely used, start the same process till the vegetable stock is used up. The rice will be cooked to al dente tender and creamy (but not mushy), takes about 20 minutes. Remove the Risotto al Nero di Seppia from heat. Add in the grated parmesan cheese. Season the Risotto al Nero di Seppia with salt and black pepper powder. Risotto al Nero di Seppia is ready to be served. Note: Cuttlefish or squid rings can be added for a more robust variation. Cook your cuttlefish or squid rings separately, and then add to the risotto mixture at the same time that you start adding the broth.